Peter Zuckerman and Amanda Padoan’s Buried in the Sky, written in the wake of the 2008 K2 expedition where 11 people died, looks at the disaster through the eyes of the Sherpa and Pakistani guides. In doing so, they reveal the biases the media, sponsors, and teams have long had against these persons who have been indispensable parts of every major expedition in the Himalayas. In the following passage excerpted from the book, the authors give the full story of Tenzing Norgay, the first guide to climb Mount Everest with Edmund Hilary in 1953 and the controversy he sparked after stepping foot on the summit. One of Time magazine’s most influential people of the twentieth century was born in a yak-herder’s tent in Tsechu, a pilgrimage site in the Kharta region of Tibet – a three-day walk from Pasang’s birthplace. Tenzing Norgay was the eleventh of 14 children, one of only six who survived infancy. His parents, Kinzom and Mingma, subsistence herders of Ghang La, sent Tenzing to a monastery so he could learn to read, but monasticism didn’t suit the boy. When a Buddhist lama beat him with a stick, Tenzing quit. At age seven, Tenzing got a glimpse of his future. In the spring of 1921, the legendary British mountaineer George Mallory pitched several camps in the Kharta region to explore Everest’s north side. During his four-month reconnaissance, Mallory spent a halcyon month in the grazing lands of Ghang La. Spreading money around, he hired local scouts and bought yak butter and cream from herders at Ghang La and Dangsar, where Tenzing’s family stayed. Mallory would die three years later below the summit of Everest, but Tenzing never forgot the hobnailed boots that his expedition left behind. Mountaineering was the least of Tenzing’s concerns in the 1920s. His family leased the herd they cared for, and one day the yaks erupted in lesions and died, likely during the 1928 pandemic of rinderpest disease. Tenzing’s father couldn’t repay his debts or support his six children in Kharta, so the family migrated across the border, possibly to Thame or Khumjung, villages in the Sherpa heartland of the Khumbu. The Sherpas in the Khumbu were relatively affluent, enjoying a monopoly on regional trade. For centuries, Tibetan salt and wool had been carried over the Nangpa La Pass into Nepal and exchanged for lowland products such as bamboo, medicinal plants, paper, rice, and soot-based ink. Tenzing labored as an indentured servant for a more solvent family, and, as a Tibetan among the Sherpas, suffered from ethnic discrimination. Inevitably, he fell in love with a beautiful Sherpani whose family disapproved of him. Tenzing, then seventeen, proposed eloping, and the girl, Dawa Phuti, agreed. The couple left the Khumbu, heading to a new life at the Indian hill station of Darjeeling. Nepal, then an insular kingdom, forbade foreign mountaineering expeditions, so Darjeeling, with its hot baths and billiards, became the recruitment hub for Everest. When the couple arrived, Englishman Hugh Ruttledge was recruiting porters for his 1933 Everest expedition. “They wanted only Sherpas,” Tenzing recalled. As a Bhote, he was turned away. “And you go away wondering if you will never get a job in your life.” For two years, expeditions continued to reject him because of his ethnicity. In the early 1930s, Sherpa mountaineers deployed aggressive tactics to force Tibetans out of the profession. Instead of merely staging strikes when they had to work alongside Tibetans, Sherpas on a 1931 German expedition even threatened to sue their paymaster, Paul Bauer, for refusing to hire and compensate Sherpas preferentially. Most expeditions, including Bauer’s, caved. Sherpas dominated the local workforce, and they could halt expeditions that failed to meet their demands. To avoid delays and ethnic conflicts, some expeditions hired Sherpas exclusively, and only local climbers who passed as Sherpa were able to accumulate experience. In 1935, Tenzing was still in Darjeeling, jockeying for a mountaineering job. Determined to hold out, he milked cows, set mortar, and read Darjeeling’s eponymous tea leaves. He finally got a break. A mountaineer named Eric Shipton was about to leave for Everest as part of a British reconnaissance when he made a last-minute decision to hire more men. At that point, pickings were slim: The most-experienced Sherpas had been killed the year before on Nanga Parbat. In a rush, Shipton decided to broaden his search and encourage Tibetans to apply. Tenzing darted up to the veranda of Darjeeling’s Planters Club, where Shipton was inspecting a throng of candidates. “[T]here was one Tibetan lad of nineteen, a newcomer, chosen largely because of his attractive grin,” Shipton later wrote. “His name was Tensing-Norkay – or Tensing-Bhotia, as he was generally called.” Tenzing was finally on his way to Everest. En route, the Sherpas staged a strike, refusing to carry loads, so Shipton had mules and Tibetan porters such as Tenzing lug the gear instead. Later, in a village called Sar, the Sherpas got into a drunken brawl with the Tibetans. Tenzing kept out of it, carried whatever weight he was given, accepted coworkers of any ethnicity, and kept on grinning until the reconnaissance ended with the approach of the monsoon. Tenzing returned from Everest with new boots, snow goggles, and a recommendation from Shipton. His obsession with the summit may have started then, but the deaths of his wife and son may explain the determination he showed in the years to come. Climbing gave him solace and, with his reputation established, work became easier to find. Eventually, he married again. His new wife was Ang Lhamu, a Sherpani who helped him gain acceptance within her community, something he’d never had with Dawa Phuti. By 1953, Tenzing had clocked more time on Everest than any mortal, and the British offered him an opportunity he couldn’t refuse. During their Everest expedition, Tenzing would work as sirdar – chief of the mountain workers – and climb as a full team member, a status the British had never before afforded an indigenous climber. Tenzing quit smoking and started carrying around a rock-filled pack. This would be his seventh Everest expedition, and he was destined for the summit. Early in the climb, Tenzing became fast friends with Edmund Hillary, a beekeeper from New Zealand. Hillary had tried to jump a crevasse but landed short, breaking off a cornice. He slid with the ice sheet into the chasm. As Hillary grasped for the sides, Tenzing snagged the trailing line, flicked it around his axe, and planted the axe into the mountain. The rope yanked tight. Hillary’s ice axe and a single crampon dropped into the fissure. Tenzing, “after positioning himself to gain some leverage, was able to gradually haul Hillary up to the edge of the crevasse, with some help from Hillary’s single-cramponed foot,” wrote Tenzing’s son and biographer, Jamling Tenzing Norgay. The rescue forged a friendship that led Hillary and Tenzing to the roof of the world. Tenzing left an offering of chocolates in the snow and tried to take a photo of Hillary but didn’t know how to operate the camera. So he passed it to Hillary, who snapped Britain’s iconic victory image: A Tibetan hoisting an axe strung with a flapping Union Jack, the most visible of his four flags. The men basked in the achievement for fifteen minutes before descending to an alien world. The sudden stardom that followed caught Tenzing by surprise. “I appeared on television, before I had ever even seen a set.” Queen Elizabeth got word of the triumph and invited Tenzing to receive the King George Medal. King Tribhuvan awarded him the Most Refulgent Order of the Star of Nepal, the Shah dynasty’s highest civilian award. Mickey Mantle sent a signed baseball bat and cheers from the New York Yankees. Not to be outdone, India’s prime minister, Jawaharlal Nehru, offered Tenzing a passport and suits from his own closet. In Kathmandu, fans mobbed Tenzing, chanting his name and hoisting him aloft on their shoulders. Rumors swirled that Tenzing had three lungs. He and Hillary rode in the Shahs’ gilded chariot and tried to ignore the banners overhead: An artist had depicted Everest with a brown man on the summit and a white stick figure sprawled below. Autograph seekers muscled in, and Tenzing, who could neither read nor write, accepted their outstretched pens and scrawled his mark. Far removed from his life in Tibet, he was visibly dazed. Such wild, postcolonial display unsettled his teammates, and the impropriety intensified when one of Tenzing’s autographs suddenly became front-page news. Tenzing had unwittingly signed a statement declaring himself to be the first to summit Everest. Hillary did not want to comment, so the British mobilized. Colonel John Hunt, the expedition leader, called a press conference to deflate the native son. Tenzing Norgay isn’t a mountaineer of Hillary’s caliber, Hunt proclaimed, and he lacked the technical skill to lead the climb. A Sherpa wasn’t first on the summit of Everest; that distinction belongs to a citizen of the Commonwealth. The backlash in Kathmandu was brutal. Tenzing’s supporters smeared Hillary as a buffoon carried to the summit in a sedan chair. Hunt apologized and retracted his statement. Hillary drafted one of his own, declaring that he and Tenzing had climbed to the summit “almost together.” The summiters signed it and released it to the press, but they failed to bury the controversy. Between Sherpas and Tibetans, another dispute arose. Which ethnicity could claim Tenzing as their own? Various Bhotia groups in India and Nepal, including those claiming to be Tenzing’s own relatives from Tibet, noted that Tenzing was born in Tibet and spent his youth there. The Sherpas made their own case. Tenzing had married Sherpanis, spent his adult life in villages with sizable Sherpa populations, and reared his children in the Sherpa language and culture. “Many see my father as the godfather of Sherpas because he was the one who brought the ethnicity into the limelight,” Jamling said. “If my father had said ‘I am a Tibetan’ then there would have been no Sherpas” as the West knows them. The Bhotias of Ghang La in Tibet would be the celebrity ethnicity. Tenzing also had an exigent reason to identify himself as Sherpa in the 1950s. China had invaded his Tibetan homeland, seizing a cornucopia of mineral wealth. Mao Zedong’s Red Army, at the crest of the Cultural Revolution, consigned roughly one-sixth of ethnic Tibetans to prisons, labor camps, and starvation. Tenzing’s spiritual leaders were under siege. The Dalai Lama fled to India. 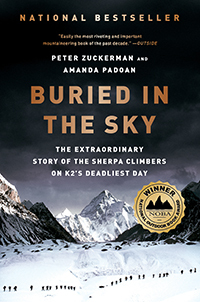 Excerpted from Buried in the Sky: The Extraordinary Story of the Sherpa Climbers on K2’s Deadliest Day by Peter Zuckerman and Amanda Padoan. Copyright (c) 2012 by Peter Zuckerman and Amanda Padoan. With permission of the publisher, W. w. Norton & Company, Inc. This selection may not be reproduced, stored in a retrieval system, or transmitted in any form by any means without the prior written permission of the publisher.